This copy is yours FREE! Tom Pace has already bought the book, all you need to do is pay the small shipping fee. 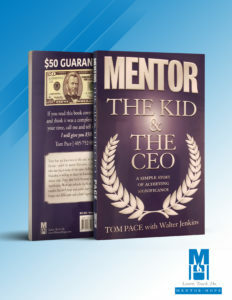 **Mentor: The Kid & The CEO retails for $14.95, it is yours FREE today. We just ask that you pay a small shipping fee ($6.99). Your information is safe and secured and will never be shared. Tom Pace wrote this book for YOU. “The Mentor” is based on real-life events that happened to Tom and those around him. He wrote this book to inspire people just like you and to show them that no matter how low life gets, you can always climb back up and be a person of happiness, wealth, and significance if you choose to be. This book is been read and listened to by people all across the world. Hundreds of thousands of people have been inspired to take the action in order to live great lives. GET YOUR FREE COPY TODAY!